The question of how to get rid of grass must be answered in a number of different ways, because the solution will vary according to what, precisely, you wish to achieve. 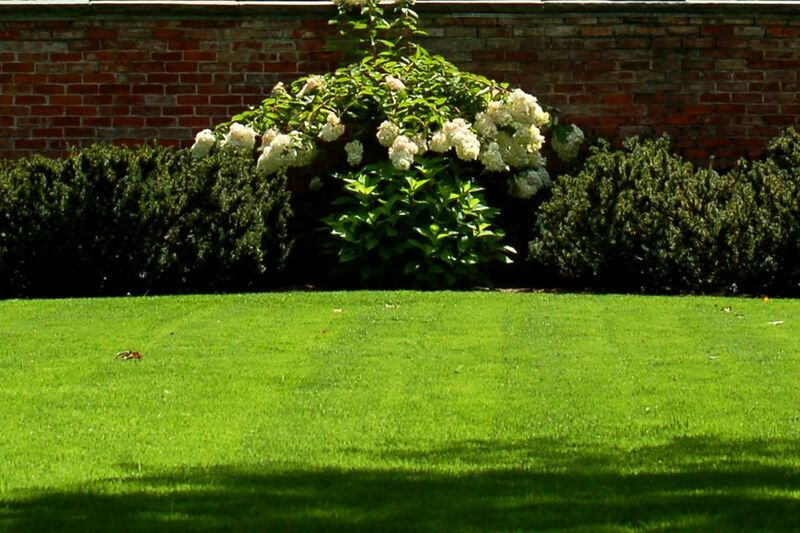 At the most basic level, we must first determine whether the objective is to reduce lawn size or merely for weed control in a small area (for example, between the bricks of a brick patio). This article deals mainly with the former, although it does conclude with a few suggestions regarding the latter. Let's focus on how to get rid of grass organically. Indeed, even though they intend to replace their patch of lawn not with a vegetable garden, but with ornamentals, many gardeners are still adamant that such tasks should be approached using organic methods whenever possible. You can rototill a lawn area that you wish to convert into a flower bed. Always access the call-before-you-dig phone number first. A large machine is preferable for this operation since you'll want more power than a small garden tiller can offer. But it's not as simple as it sounds. The stolons will remain in the soil after you're done tilling, and you'll find yourself pulling grass shoots for a long time. Now let's consider the pros and cons of each. Presumably, you'll be able to get your hands on a sufficient supply of newspapers for free; "free" always counts as a pro, don't you think? If you haven't saved up a stash of your own newspapers, you can always check with friends looking to clean out their attics or with recycling centers, etc. Another pro with newspapers is that they break down into the soil over time, meaning there's nothing to clean up after you've accomplished your mission. Furthermore, if you wish to plant landscape shrubs in select areas while waiting for the rest of the lawn to die, just dig out the sod in those areas and do your planting (you can skirt those spots easily enough when laying down the newspaper, which is a flexible material). The newspaper may be free, but you're unlikely to get away with paying nothing at all for this project. You'll want to cover your newspaper with mulch, and that will probably cost you some money. But the mulch also breaks down, returning nutrients to the soil -- not a bad deal. The main con: this way is more labor intensive than some of the others covered here since you're handling numerous individual units (i.e., the sheets of newspaper). Spreading landscape fabric over the ground after rototilling, then covering it with mulch, is a way to get rid of grass that works best, once again, in shrub beds, where you don't need access to much of the soil under your covering. You can simply pocket plant afterward. "Pocket plant" refers to the fact that you'll be making holes in the landscape fabric only where the shrubs are to reside. Simply dig down to remove enough of the soil to make room for each shrub, then plant. Why is this method to be undertaken specifically in conjunction with rototilling? Because landscape fabric, being permeable, is not a great smothering agent. But the trade-off is that this very permeability makes it easier for your shrubs to grow in the covered area. A con with this method (plus the black plastic method, which is covered below) is that it's restricted mainly to shrub beds since perennial beds would require too many holes. Should you ever change your mind and desire a perennial bed in this spot, you'll have to pull out all the landscape fabric, which is a lot of work (roots will become entangled in it). To hide the tarp for aesthetic reasons. To hold down the tarp, so that it doesn't blow. To protect the tarp against wear and tear from foot traffic. Landscape fabric is permeable enough to allow sufficient amounts of air and water through; a tarp is not. Cutting through a tarp will compromise the material and cause it to shred, so you'll end up with a gaping hole where you wanted just a small one. Consequently, while a tarp will smother the lawn, you have to wait until after it has finished doing its job (and after you've removed it) before you can plant the area unless you use container gardens or raised beds. Black plastic represents something of a compromise. It doesn't have the permeability of landscape fabric, but, if you're careful, you can cut through it and pocket plant (unlike with tarps). Precisely because it's impermeable, it acts as a smothering agent (like tarps), so there's no need to rototill first. Again, cover it with mulch. The high temperatures it generates can kill beneficial organisms. Finally, in hot climates, a way people sometimes use to get rid of grass is to cover it with clear plastic. Here, though, you're not smothering the lawn, you're giving it a deadly sauna treatment. Water first, then cover with the clear plastic, securing it (with scrap lumber, etc.) at the edges. Periodically apply more water. Such soil solarization is also employed in scrubby, weedy areas when you're trying to start a garden from scratch, as the hot temperatures will kill weed seeds. A con when you adopt this way of getting rid of grass is that you can't grow plants in the area at the same time. And as with black plastic, you may well end up killing some of the microbes that benefit the soil. A con of all of the smothering methods that let you grow plants at the same is that they necessarily present you with a dilemma (unless you choose to be patient and simply wait until the job is done before doing any planting). For, on the one hand, you don't want your planting holes to be any bigger than they have to be to get the plant into the ground. The bigger you make the holes, the more of an opportunity you're giving to the grass to poke back up through the surface. On the other hand, expert sources such as Clemson Cooperative Extension recommend that you mix compost throughout each shrub's rooting zone when you plant a bush. In order to follow this advice, you will need to dig a hole that is fairly wide. Have the disadvantages listed above put you off on the "cover-up" methods? Another way to get rid of grass is to physically remove it, roots and all, using a spade or shovel. One can hear the collective cry now, rising up across cyberspace: "But that's back-breaking work, isn't it?" All right, so you already know the major con attached to this approach. It is balanced out (for those healthy enough for the task) by the pro that it is quick. Well, depending on how quick you are with a spade. Do not dig sod out and then simply cart it off somewhere. Instead, bang out the soil, then dispose of the grass and its roots. Why? Because you would only have to replace that soil (one way or another) when you begin planting there. Many who use this method find it most efficient to overturn several squares of sod in a portion of the area, then bang the dirt out of them, one by one. How do you bang out the soil? Some like to jam a spade into the ground sideways. Then they will pick up a piece of sod by the grassy part and force the dirt side down on the sharp blade (wear sturdy gloves, and exercise caution if you're injury-prone). Think in terms of squeezing orange juice. Depending on how tired all this activity makes you, you might wish to break up the operation into several days, tackling only a selected portion of the overall lawn area to be transformed each day. Now the objection to using sod cutters for this job becomes clear. Unless you have the money to skip banging out the soil and to have a truckload of loam delivered later, what's the point in renting a sod cutter? The hard part of the job is not digging out the chunks of sod but knocking out all that dirt from them. Save your money and use a spade. So far, only ways to get rid of grass on a grand scale have been presented; that is, cases where you are converting large sections of lawn to planting beds. But what about cases where a spot treatment is called for? Depending on the circumstances, this is where some homeowners turn to non-organic methods, i.e., herbicides. In an area that you wish to convert to hardscape, either a non-selective herbicide such as Roundup (glyphosate) or a selective herbicide targeted to grass removal could be used. If broadleaf weeds are also present, use the non-selective herbicide. Some folks, in fact, use herbicides in lieu of the organic methods discussed above to eliminate large swaths of lawn, but, for health reasons, this approach would be ill-advised if you plan on growing vegetables there later. But what if you wish to remain organic even for spot treatments? In fact, in some circumstances, it's rather silly to waste money on herbicides. For example, how should you get rid of grass coming up here and there in a small flower border? Here, hand-pulling is your best choice, both in terms of saving time and money. But even in situations where using herbicides may make sense to some, others will prefer to stay organic. What are your options to get rid of grass that is growing up, say, between the pavers of a stone walkway? Well, you can't get any more organic than water, right? So don't waste that water you boiled on the stove while cooking. Instead, pour it (carefully) on that unwanted vegetation after you are done with it for cooking. Finally, you can also get rid of grass safely in hardscape areas by spraying vinegar on the offending blades. What Is Caliche Soil and How Do You Improve It?